Recently we have started carrying the ZPower Rechargeable battery system for our ReSound, Widex and Oticon lines of hearing aids. The reason for this is basically one of convenience for our patients. All of our patients receive a free lifetime supply of batteries with every new hearing system, but sometimes “free batteries” aren’t the answer due to a patient’s physical limitations (neuropathy, arthritis, etc…). Let me make a note here that most of today’s hearing aid batteries, available from us, your local drug store or online, are of the disposable zinc-air variety. You simply pull the tab off the battery, let the battery sit for a minute or two and put it in your hearing aid. You would then open the battery door at night when you take your hearing aids out and change the batteries approximately once a week. In the old days, nickel-metal hydride (NiMH) rechargeable batteries were the only game in town. The battery charge was oftentimes inconsistent, and you would normally see 10 to 14 hours of “live” hearing aid operation before you needed to recharge them for 6 to 8 hours. The next step was lithium-ion batteries which were better, but they are only offered in a “sealed” system which will not allow you to use a regular zinc-air battery in case of emergency. Now, we have silver-zinc rechargeable batteries by ZPower which seems to be the best of the bunch by a considerable margin. So here are a few talking points from ZPower. ZPower’s silver-zinc rechargeable battery technology delivers over 40% more energy storage than other rechargeable miniature batteries. Only ZPower’s rechargeable silver-zinc battery technology can deliver over a year of dependable power, being recharged every day, without significant capacity fade. ZPower’s batteries are one of the most environmentally responsible batteries available. They are water based, nonflammable and fully recyclable. There is an improved user experience. After completing several clinical trials, the majority of patients did not want to exchange their rechargeable hearing aids and return to using disposable zinc-air batteries. Patients were able to use their aids for a full day (in some cases 24+ hours) even with wireless streaming, recharge in 3-4 hours, and still have remaining capacity. 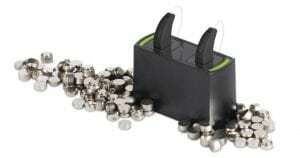 One ZPower rechargeable battery is needed per hearing aid each year. The silver-zinc battery is equivalent to an estimated 100 zinc-air batteries. It will last for a full year and the patient can purchase a replacement at the clinic. So…for those folks who want “convenience” we have an answer. For everyone else, the traditional zinc-air batteries, which are free from us, continue to be an excellent way to go. ← It’s All About Hard Work!